Between tweeting on our TVs and banking on our smartphones, the future is a very strange place. The KFA2 GeForce GTX460: graphcis card or futuristic porcupine? Nvidia, makers of graphics cards, took a step into a strange future recently when they announced a wireless graphics card, the KFA2 GeForce GTX460. 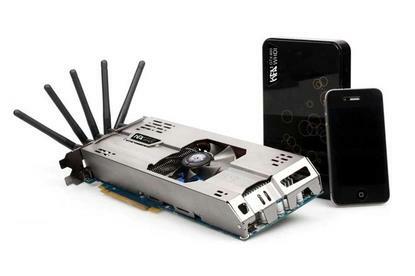 What are you going to do with a wireless graphics card? For one, it’d give that TV that you’ve been watching YouTube on in your living room a graphics boost without requiring a laptop or desktop. With a processor speed of 1.35GHz, 1024MB of memory, and 336 cores, we only hope that your wireless network is up to the task of transmitting all those polygons and pixels from the card to your display. Do you think wireless GPUs have a future? Sound off in the comments!